A major exhibition, Wolf Kahn: Landscape of Light, 1953-2006, premiered at the Brattleboro Museum & Art Center (BMAC) on July 29 and will be on view through November 12, sponsored by Foard Panel. Filling BMAC's two large galleries, the exhibition focuses on Kahn's explorations of color and light from the 1950s through the present. Capturing the way in which light coalesces around form, substantiates it, or dissolves it is a central theme in Kahn's painting. Curator Mara Williams says, "Over the course of fifty years, he has become a master of color, able to coax the subtlest whisper or the most bombastic oratory out of his color combinations." For more than half a century, he has balanced the sensuous qualities of color, light, and paint with a relatively stark geometry of form. His paintings hover between abstraction and figuration; palpably about place, they nevertheless transcend mere description. Born in Stuttgart in 1927, Kahn fled Germany for the United Kingdom at age 12 and moved to the United States in 1940. After attending the High School of Music and Art in New York City, he continued his studies at the Hans Hofmann School in New York City and Provincetown, on Cape Cod, becoming Hofmann's studio assistant. He later relocated to Chicago, where he received a bachelor's degree from the University of Chicago. Kahn's exploration of the tensions between form and color began when he was a student of painter Hans Hofmann, a legendary teacher of the dynamics of color. He came of artistic age in post-World War II America, when abstraction was the ascendant art movement. Many of his peers at the Hofmann school and around New York City were including figuration in their work -- a daring move at the time -- and Kahn garnered favorable critical notice for his figurative work in the 1950s. In December 1956 Kahn followed artist Emily Mason, whom he had met earlier that year, to Italy. His artistic maturation took place there over the course of two years, as he explored how to capture the fleeting optical effects of light in fog, haze, and harsh winter light. These canvases, inspired by nature and light, are stark, refined, and taut. Kahn and Mason returned to New York City in 1958 (they had married in Italy in 1957), and in the summer of 1959 they traveled to Martha's Vineyard, where Kahn continued to paint from nature. By the mid-1960s Kahn was working in a near-abstract manner, without reference to humanity. During summers on Martha's Vineyard or in Maine, he encountered New England's iconic silhouette -- the barn -- an object implying human meaning and purpose. A large volume set amid simple surroundings, a barn's looming presence was for him intriguing and confrontational. He could not resist working with such a large, simple shape. 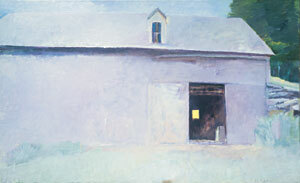 His First Barn (1966), which appears in the BMAC exhibit, is a hulking, inky purple-black shape, almost filling the entire large canvas. Capturing dusk light in the forest and its play against so large a surface may have been Kahn's immediate aim; but it is striking how psychologically fraught and foreboding the image is. The ability of a painting to convey meaning beyond the artist's intention is the alchemy of the aesthetic experience. Although his barn paintings were his best-known works during the 1970s and 1980s, barns were not the only subject of Kahn's prodigious artistic output. Having bought a farm in West Brattleboro, Vermont, in 1968, where he and Mason based their family during the summers, Kahn found many views to attract his eye -- forests, meadows, rivers. Each new vista offered possibilities for making the imperceptible perceptible through color relationships. Kahn's use of color had always maintained some relationship to the natural world. During the 1990s, his color explorations knew no bounds. When he found an industrially made artificial color that interested him, he set to work discovering how he could make it believable. Panache, dash, swagger, verve describe both the artist and his art of this period. Daring and brash as the paintings are, they succeed because of Kahn's nuanced understanding of tonality. By the late 1990s he returned to a weather phenomenon that had fascinated him throughout his career -- fog. 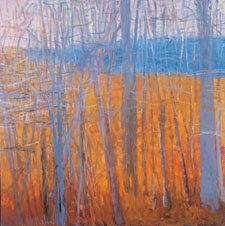 Fog banks allow the artist to create a dialogue between what is seen in, and what is felt through, the painted surface. 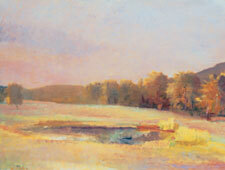 In his earlier work, a translucent atmospheric effect mediates the viewing experience. But in many of the later paintings, fog appears as a giant grey slab occluding vision. The Fog Bank on view in BMAC's exhibit was begun in 1997 and only recently completed. It hung unfinished on a wall in Kahn's studio for nearly a decade. He started the painting just about the time he began to notice the effects of macular degeneration. Changes in his perceptual field added new possibilities for exploration. Ever curious, he has embraced those changes and pushed his art to a new level. Kahn's most recent paintings hark back to work he did forty years ago in Italy. 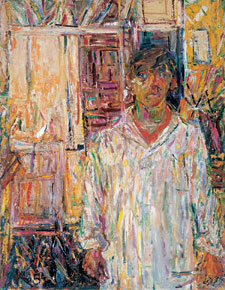 As before, by reducing the formal structure underpinning a painting, he allows perceptual phenomena to move to the fore. The new work is austere, but alive with sensation. These are virtuosic compositions, symphonic in scale and complexity, at once original and a précis of the art historical influences of a lifetime. They are rigorous, dramatic, inimitable -- the work of a master. Kahn is a Fellow of the American Academy of Arts and Letters and has received honors such as Fulbright and John Simon Guggenheim fellowships and an Award in Art from the American Academy. His works are in the permanent collections of major museums, including the National Museum of American Art, the Metropolitan Museum of Art, the Boston Museum of Fine Arts, the Whitney Museum of American Art, and the Brooklyn Museum, as well as numerous international museums. "The Uses and Misuses of Painting" is the intriguing title of a talk that Wolf Kahn will give on Thursday, August 10, at 7:30 p.m., at the Brattleboro Museum & Art Center. 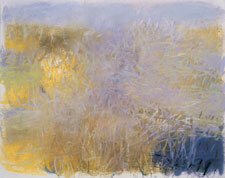 The talk is presented in conjunction with the exhibition Wolf Kahn: Landscape of Light, 1953-2006. Admission is $4 for adults, $3 for seniors, $2 for students, and free for BMAC members. According to Kahn, "Painting has traditionally been about description, but always with an underlying concern with visual language." How the visual language is used "determines the difference between good description and bad description." The history of painting "ended up in abstract painting, but there is also good abstraction and bad abstraction." Kahn plans to illuminate both descriptive and abstract painting using the same criteria. Since his paintings are in the galleries, he won't be showing slides of his work with this talk. A popular and engaging speaker, and a longtime neighbor and friend of the Museum, Kahn always draws large audiences to his talks, and he delights them with his humor and insights. Known throughout the world as well as locally, he is one of the most successful artists of our time. Museum galleries are open daily except Tuesday, 11 a.m. to 5 p.m. Admission is $4 for adults, $3 for seniors, and $2 for students. Museum members and children six years old and younger are admitted free of charge. The Brattleboro Museum & Art Center is located in Union Station at the intersection of Main Street (Route 5) and Routes 119 and 142 in downtown Brattleboro. The Museum is wheelchair accessible; an ASL interpreter for the hearing impaired will be provided if requested two weeks in advance. Parking is available in front of the Museum and at the nearby Marlboro College Graduate Center parking lot. For more information, call 802-257-0124 or visit www.brattleboromuseum.org. The Brattleboro Museum & Art Center is a nonprofit organization founded in 1972, whose mission is to present the art and ideas ways that engage, educate, and inspire audiences of all ages. Compelling new exhibits by regional and internationally acclaimed artists are shown each season. The Museum Shop, open during regular Museum hours, features an eclectic assortment of books, gifts, and note cards from local artists. The Museum is financially supported by grants, donations, and sponsorships, and by membership and program fees. The 2006 season is sponsored by Entergy Vermont Yankee.